A resident of Montreal, Canada, Patrick Bernard is currently celebrating twenty years of well-being music. Born in Algeria in 1952, at the age of 11, Patrick and his family moved to France. In Algeria during the Algerian revolution, Patrick witnesses the cruelty of war. This is why he decided to only bring peace and harmony where ever he would go. At the age of 16, Patrick starts traveling the World, hitch hiking where ever the wind would bring him. 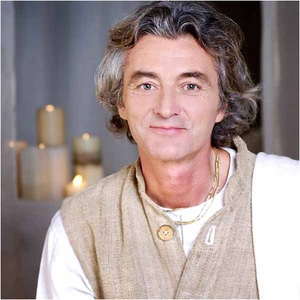 Bernard's blend of soothing instrumentation with his soft devotional chanting is a perfect companion for any healing practice, be it mediation or yoga. Long before contemporary chant was trendy, Bernard was inspiring audiences with his powerful devotional compositions based on sacred Sanskrit, Latin and Hebrew writings. Mr. Bernard's recordings of "well being" music have consistently achieved high status, winning awards, achieving Gold status and even landing him on the Billboard charts (he was the first Canadian to climb Billboard's New Age chart). Patrick has remained a best seller in his category for many years. Atlantis Angelis touched the heart of more than half of million people around the World! Since 1986 he has been a full-time producer/composer of devotional music, inspiring audiences everywhere with his sweet and profound music of divine love. Adding to his music collection of 12 records, Patrick recently release a new book called "Music As Yoga, Discover the Healing Power of Sound". In 1974 Patrick came in contact with his spiritual master, Srila Bhaktivedanta Swami Prabhupada, who initiated him in Mantra-Yoga or chanting of the Holy Sound Vibrations. In 1986, receiving Gayatri Mantra in Nabawip, India, from the great saint Srila Bhakti Raksak Sridhar Deva Goswami Maharaja, Patrick was initiated into the Gaudiya Vaisnavas School of bhakti-yoga propagated by Sri Caitanya Mahaprabhu, the 15th Century master of devotional ecstasy. Since then, he has been a full-time producer/composer of devotional music, inspiring all listeners with his sweet & profound music of divine love.